Please join us tonight, Tuesday, February 5th from 6:30 to 8:30 PM for a Know Your Rights! training that will be hosted by Picture the Homeless. Here, you will learn your rights with the NYPD and how to exercise those rights as safely as possible. We will also be holding a Cop Watch! 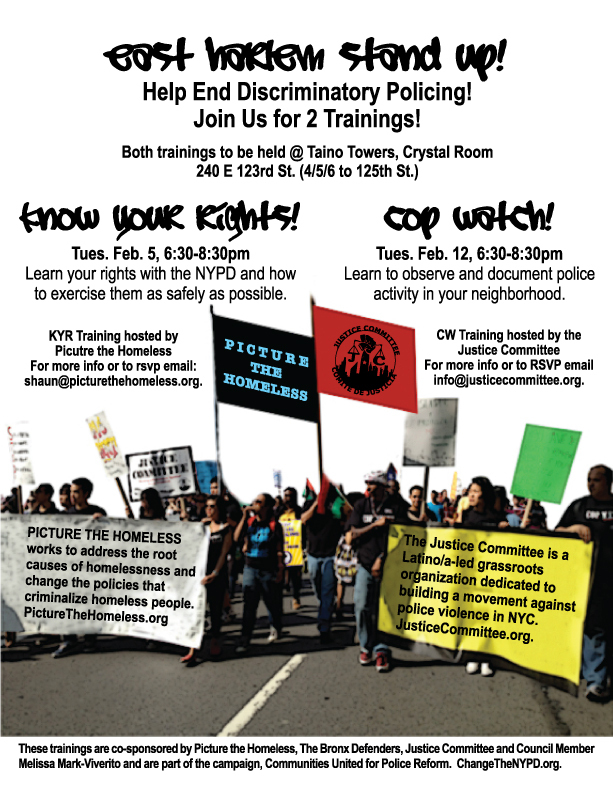 training next Tuesday, February 12th from 6:30 to 8:30 PM, hosted by the Justice Committee. At this training, we will learn how to observe and document police activity in your neighborhood. The ultimate goal of these trainings are to help end discriminatory policing – we believe in standing up and being a part of the solution. This entry was posted in Blog, Citywide, East Harlem, Events, Take Action! and tagged Change the NYPD, Communities United for Police Reform, discriminatory policing, East Harlem, East Harlem Stand Up!, free, Justice Committee, Know Your Rights, NYPD, Picture the Homeless, police reform, Stand Up!, Stop and Frisk, The Bronx Defenders, training. Bookmark the permalink.